This letter was sent to me by Dorothy Crowshaw from the West Midlands in April 2003. I can give you some information on the two Dicketts from the Elmswell cemetery, William is my two Great Uncle, William was born 1820 in Shaftesbury son of Jonathan and Sarah Dicketts. Baptized June 17, Shaftesbury, Dorset. Having no luck anywhere in the 1881 census for William, although there is some of the same names these came from Wiltshire and are all related. 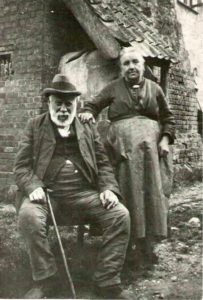 I was lucky to find my William and his Wife in the 1901 census, aged 60 years in the parish Elmswell Entire, living on his own means, Susannah aged 76 born Great Bromly Essex. William Dockets a Widower aged 62 a Tailor, married Susannah Nicholls a widow aged 58, both abode at St John’s. Susannah daughter of William Warner a Tailor, on May 12th 1884, St John’s Colchester at St John Church, County of Essex. The death of William was 16, October 1902 aged 82, Tailor [ Master] Susannah Dockets present at the Death , Elmswell. Susannah must have been buried with him, her death date I have to search for yet. We have a photo containing Farrows, Kings and Palmers. The following contribution came on 31st December 2003 from Martin King, who lives in London; thanks to him for sharing his research! The first verified record I have is the marriage of James King (my great-great-great-great grandfather) (1802-1851) to Jemima Thompson (1806-1888) on 2 November 1826 in Elmswell. They are shown in the 1841 census living with their 5 sons. In the parish records that I have found recording the baptism of some of the children, James’s occupation is listed as Wheelwright. James died of smallpox on 25 January 1851 in the Stow Union workhouse, and the 1851 census a few months later still shows Jemima in the workhouse aged 49 with some of her younger sons. My great-great-great grandfather was the James from the above; he married Sophia Manning (1831-1904) on 13 April 1849 at the Walsham-Le-Willows Baptist Chapel – just in time it would seem, as on 13 June 1849 their eldest child and my ancestor, another James, was born. The couple went on to have two further children both of whom died at a young age Harriett (1852-1868) and Robert (1855-1864). Some time between the birth of Ethel and Thomas the family moved to Wetherden. Most of the men were employed as Agricultural labourers, Traction Engine Drivers or on the Railway. Whilst most of the family stayed in Elmswell and the surrounding villages Dennis (1841) was a railway guard and the 1881 census places him in Lambeth (then part of Surrey) and the 1901 census in Chard in Somerset. My great grandfather Arthur left Suffolk some time in the mid 1890’s and was married in Hackney and settled in Leyton, Essex (now part of the London Borough of Waltham Forest). 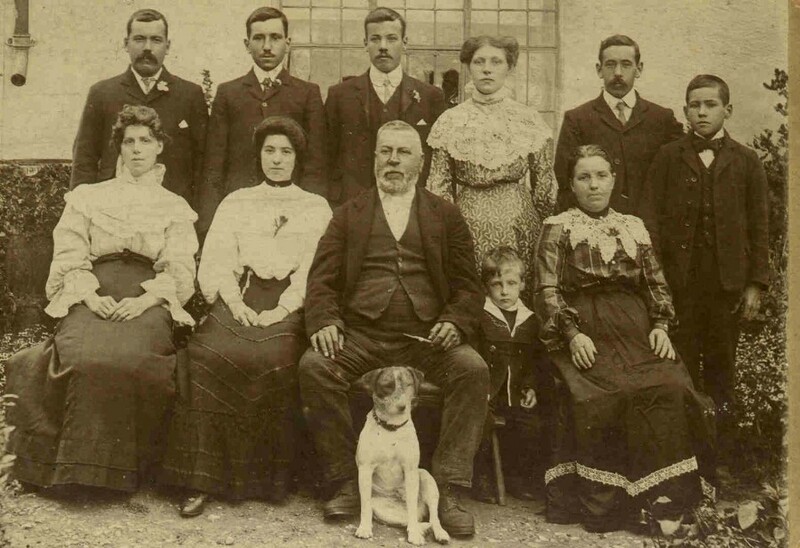 Most of the information has been taken from census returns and my knowledge of the extended family ends with the 1901 census apart from the lives of James (1880) and Thomas (1885), who eventually settled in Great Bentley, Essex. A further e-mail was received on 12th November 2004, as follows: “I was very interested when I found your website. I have been researching my husbands family tree, His grandmother was Ethel King, daughter of James King and Eliza Farrow. She married William Coleman. My husband Brian, is really pleased, to now have a photo of his great grandparents. I am related to Thomas Emanuel Robinson. Apparently he is accredited with the idea of the Bacon Factory in Elmswell. I know he was farmer and lived at Small Wood Farm, Bradfield St George in 1904 (I can’t find this farm on any maps). He was originally from Yorkshire and he died in Harrogate in 1924 – he is buried in the family plot in New Wortley – Leeds – he was living with his wife Beatrice in Bury St Edmunds at the time. I know very little else about Thomas. The family were all “industrial revolution” businessmen, starting as Leeds clothiers, then branching out into corn and floor dealers. They bought a steam corn mill. From here they vertically integrated into maltsters and brewers. I suppose farming is just one step further. I am trying to trace any of his descendants (he had a son William). Does anybody in your group know of the family and whether there are any surviving members of the family? There are of course numerous Robinsons in the school register, the two wars, and the cemetery. It seems my family were based around Elmswell, although more recently they farmed at Elm Farm at Stonham Aspall. I have just started to trace the family and have a connection back to a Martha Salmon who was born in Elmswell around 1739 and from then on we seem to have found a fairly clear line. My wife’s maiden name was also Salmon by chance and so we have an interest in following up our lineage. I have a will of my great great grandfather who lived at a house called Catalpa in Coddenham I believe. Glancing through my scribbles about the 1841 census, I see that there was a Thomas Salmon aged 70, at a different address another Thomas aged 40, gardener, and, at a dwelling in Warren Lane, a John Salmon aged 30. There are several Salmons in the Cemetery, two WW1 soldiers, and nine in the school register. E-mail and attachment from Eileen Smith, in the Chelmsford area, March 2004. Norman – we e-mailed in January – I now attach my family tree relating to Elmswell – my line is indicated in Red although I do not have confirmation of William Farrow’s first and second wives – that information was put together from census information and parish records. Perhaps someone from Elmswell may have further information. Martin King – to whom I find myself related has been a great help. I visited Elmswell and Woolpit last September with my mother (its also her line) two beautiful Suffolk villages and we wandered down the Lanes where we had addresses from the census – wonderful! I hope you don’t mind my contacting you like this, I retrieved your e-mail address from the Elmswell Millennium History Group Website. I am looking for any relevant information or tips you, or somebody else in Elmswell, may have on how to best begin a search for a former Elmswell resident and his family. The person I am interested in is my great-great-grandfather, and although other members of my family have gone as far back as his arrival to work as a maltster in Burton upon Trent in the late 1870s, they have been unable to take it any further out of the town. His name was George Buckle, and he was born in Elmswell in 1857. I have a lot of experience in tracing family trees and understand the different government bodies that hold information about individuals, but would like to know if there are any resources local to your village that may help me in understanding who George was and where he came from. Very best regards, and many thanks in advance for your help. When I recently decided to research my family history the Buckle side presented the greatest challenges. My Grandfather was born in Newmarket in 1907 and died in 1990 and neither my father nor I knew anything of the origins of his parents. I myself was born in Newmarket, had spent much of my childhood in Bury St Edmunds, but have now lived in the Peterborough area for many years. Having found a few clues on the Church of Latter Days Saints site, obtained my grandfather’s birth certificate and trawled through census records I discovered that my Great Grandparents were Thomas William Buckle and Sarah Elizabeth Ramsbotham both born in Elmswell in 1872 and 1873 respectively. 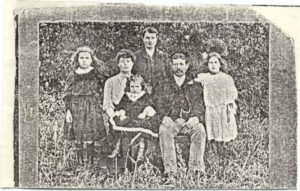 They had married in 1895 and lived in Hunston in the early years of their marriage as their first 2 children were born there. Around the turn of the century they had moved to Ipswich where they were living at the time of the 1901 census but had then moved to Newmarket before 1905 as their other 2 children, including my grandfather, were born there. They stayed there for the rest of their lives both dying in the 1940’s. Further research, helped greatly by the Elmswell History Group Website, identified that at least a further 3 generations of my ancestors had lived in Elmswell. In fact from the 1840’s to the 1890’s there were many Buckles living in Elmswell. In the census of 1871, 1881 and 1891 there were around 20 in each year. Parish records show many baptisms, marriages and burials as well as many instances where they were witnesses at other marriages; they seem to have played their part in the Elmswell community of the time. However by 1901 there were relatively few left. Pearl Buckle probably my 5 x Great Grandfather was married to Mary Barrell in Thurston Parish Church on 19th August 1782. Although I have not fully proven that he is the father of Pearl (below) it is a safe assumption as Pearl was a family name (I have identified 4 so far) and I have found no other instances of the use of that name elsewhere. My 4 x Great Grandfather Pearl Buckle, born about 1782, had married Mary Moss in Walsham le Willows Parish Church on 12th February 1810, and in 1841 he was living in the Lion Inn Elmswell. I believe Mary had died in 1832 and was buried in Elmswell Parish Church but have not yet fully proven this. Their only son I have so far identified (I’m sure there must have been others) is my 3 x Great Grandfather Philip Buckle who was born in Norton about 1814. At the time of the 1841 census he was living in Great Ashfield but on 12th October 1841 he married Lucy Clark in Elmswell Church. Pearl died a couple of years later and was buried in Elmswell Church on 8th February 1843. 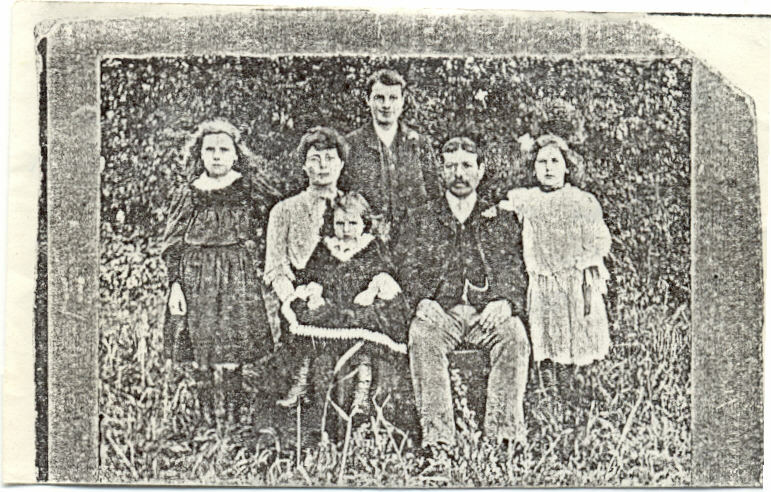 Philip and Lucy both lived in Elmswell for the rest of their lives and had at least 10 children between 1843 and 1865. The third of these, James Buckle born about 1847, is my Great Great Grandfather (father of Thomas William). During their lives in Elmswell Philip and Lucy lived in Ashfield Rd, Botney Bay Lane and Stubbings Lane. Philip was a farm labourer all his life (as was his father) but was a Pauper at the time of his death in 1898. Lucy died in 1901. James moved to Chelmsford in the 1860’s to work as a Railway Porter. He married Harriet Bruce there (although she was also from Elmswell) in 1868 and their first child Julia was born there in 1870. They must have moved back to Elmswell in 1871 or 1872 before the birth of my Great Grandfather, their second child. They had at least 8 children the first 5 being born in Elmswell. James was once again a farm labourer on his return to Elmswell and up to the early 1900’s after which I have no more records. In Elmswell James and Harriet lived in Buttenhaugh Rd before moving to Norton sometime between 1881 and 1883 to live and then to Hunston sometime after 1891 but before 1901. I have not yet discovered when or where they died. 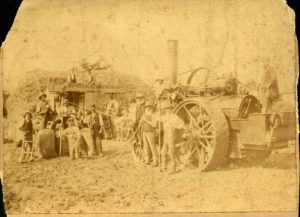 Virtually all of my ancestors I have identified during this period were farm labourers as I expect their families had been for many generations. Records show that they probably started work as young as 10 years old and continued well into their 70’s if they lived that long. Life must have been extremely hard and once too old to work they probably became paupers. One exception seems to have been Robert Buckle, eldest son of Philip, born in 1843. By the time of the 1891 census he was described as a farmer and employer rather than a labourer, unfortunately he died the following year. His apparent increased wealth perhaps explains why his grave, with a large inscribed headstone which is still in good condition, is the only one I could find in Elmswell Church Yard. I expect that the others had no headstone or a much simpler affair which has not survived. The families were typically very large. Eight to ten surviving children was common with the births spread over a period of 20 years or so. There were almost certainly other still births and some of the children did not reach maturity. I have found no evidence of mother’s dying during childbirth in my Buckle ancestors but this was common also and I have uncovered several cases in my mother’s ancestors. My ancestors had probably moved between the villages in the Stow area for many generations working on different farms. You only have to look at the census records, war memorials, graveyards, etc to appreciate how many people with the name Buckle there were, and still are, in the area. There seems to have been much more movement though from the 1870’s. I have identified that some of Philip’s other children moved to Ipswich, Kent and Burton on Trent also moving away from agriculture and working in Oil Mills, the Railway, Breweries, etc. My own Great Grandfather worked as a coalman for most of his life. I’ve still a lot more research to do on this subject and will probably have to labour away in the Bury Records Office to facilitate this. If anyone in Elmswell or elsewhere can help I would be grateful for any information. I believe that the first known occurrence of the Buckle surname in Elmswell was in 1524, perhaps there is a link to that individual. I’ve included an Outline Descendents Chart from the first Pearl Buckle to my Grandfather also highlighting those who lived in Elmswell. There is an expanded version on my website. The Parish Council noted a significant gap in the December meeting. In the section at the end, when the public are invited to have their say on, ‘any matter relevant to Council business’. Rex Durham didn’t contribute. For Rex passed away on Sunday, 19th December. A small private informal ceremony was recently held to plant a tree in memory of Rex Durham on land at Gardener’s Walk, once the village greenspace that Rex tried so hard to save. The Elmswell Communty Wood Group, of which Rex had been a member, made a contribution towards the purchase of the tree and a plaque. The tomatoes succeeded, for Rex had famously green fingers, but the Green was lost. Rex’s energetic comments on the decision did him enormous justice as a fighter for what he considered to be right. But they should not be repeated here. Undaunted, he went on to battle for the retention of Footpath 9, also lost, and for many smaller causes which succeeded – all to the greater good of the community. 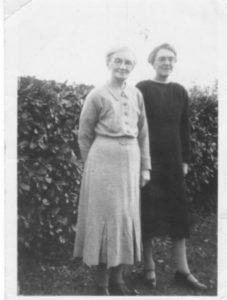 This wartime picture shows, on the left, Harriet Durrant, an infant schoolteacher at Elmswell School. With her is Olive, her invalid sister, who, we are told, ‘took to her bed every winter as the house was so cold’. The Durrant sisters lived opposite the Tate & Lyle sugar factory and workers’ cottages on Ashfield Road near the junction with Grove Lane, where Lyle Close now stands. This photograph was recently donated by Vera Owen, who now lives at Stilton near Peterborough. 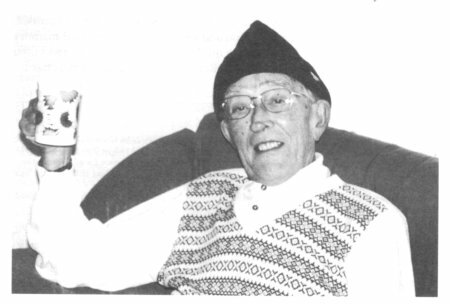 Bill Armstrong was, I believe, born in Shelland, and was buried there when he died in about 1990. His sister married Mr Wright, who ran a radio shop in New Road, and in 1947 his father bought from the Mulleys the house now called The Willows, on the New Road/Cooks Road corner. Bill and his wife Eve moved into that house in 1948 and lived there until 1985, when they “retired” to a new house in the William Armstrong Close – not a coincidence, this street name, as it was a recognition of Bill’s long service to the village, including helping to build the old Memorial Hall, and stints on the Parish Council. Bill was an employee of Eastern Electricity. Eve also served the village industriously, most recently as choirmistress at St.John’s. She moved to Bottisham in the late 90s to be near her daughter, and died in about 2008. The picture right was printed in the Newsletter of March 2006. Chairman of Elmswell Parish Council, Mr Bill Armstrong, cuts a tape to mark the opening of the much-needed new road. 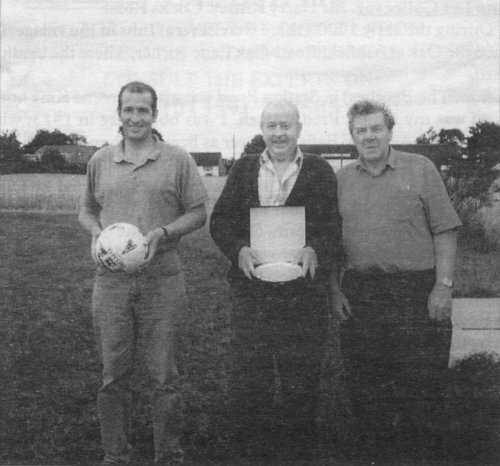 On the far left is Mr Ian Turner, and Mr Stan Turner stands behind the chairman. Others involved in the road project are also featured in the picture. Vic was born at Grove Lane, Elmswell in 1919 and attended Elmswell Primary School. Vic first became Committee member to Elmswell FC in 1937. In 1938 he became Captain of the 2nd XI, and in 1939 he became Captain of the 1st XI. 1940-46 saw the outbreak of the war. Vic became a soldier and served on the war front in Africa. After approximately 2 years of fighting Vic was badly injured and this unfortunate event resulted in Vic losing a leg which was amputated in a Liverpool hospital. In 1947 Elmswell were again made homeless; Vic and Mr Elliston approached Mr Miles of Great Ashfield and obtained permission to play at Grove Lane opposite the present-day ground. In 1948 season Vic became treasurer,selection committee member, part-time groundsman, and ball maintenance man. With the limited use of telephones. Vic used to cycle to the adjacent villages of Norton Tostock and Woolpit to notify the selective players, all this achieved on one leg. Committee meetings during this period was moved to Vic’s home address to eliminate his travelling, poor Stella!! Added to this, Vic had one of the first televisions up Wetherden Road. A 9-inch screen with a magnifying glass attached, and we lads used to congregate there on sports nights and F. A. cup finals where Stella would provide tea and biscuits. In 1952 Vic gave up the treasurer’s job to become club secretary, during this period the club was quite successful and it was commonplace for three bus loads to journey to the most important away games, transport organised by Vic. In 1956 Vic added the treasurer’s office to his existing secretarial duties. He continued to do both jobs until 1961, when he decided to have a break, although he continued to be a committee member, and ground negotiator as, at this time we always had trouble getting a ground. During this break in office it was unanimously agreed to make him a life member of the football club, which is an honour rarely given to anyone. It spurred Vic on and in 1964 he made a comeback as secretary and continued until 1967 when he finally retired as secretary, although he still supported the club in many ways. So we say to Stella (Vic’s wife), we oweher a great deal of gratitude for the way she supported him and us so we could have the services of such a remarkable, inspirational and genuine man. Elsie was born on 28th March 1906 at Gt. Ashfield. She spent her early years in and around Suffolk. She entered domestic service at the age of 14 and a few years later moved further afield. She returned to Norton where she was housekeeper to Doctor White Jarvis. She moved to Felixstowe with the doctor in the 1940’s. In 1950 Elsie’smother died so Elsie chose to return to the family home at Badwell Ash to look after her father and two brothers. In 1959 Elsie moved with her father and brother, George, to Valley View, Wetherden Road, Elmswell which has now been demolished and a new house built there. After the death of her father Elsie and her brother moved down the road to Cross Street where she lived for almost 40 years. While living in Elmswell Elsie worked for some years at the Bacon Factory. 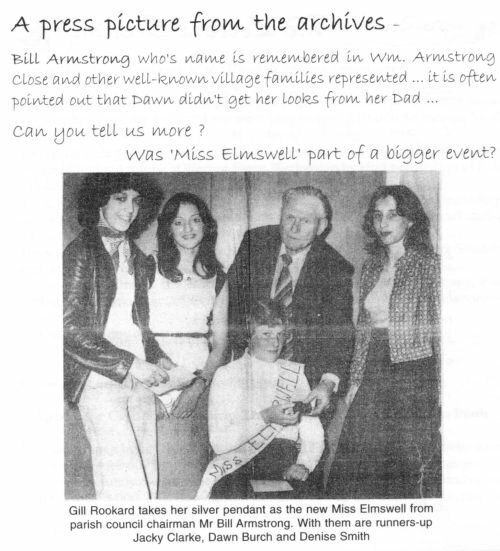 She was also a member of the over 60’s Club which was then run by Bill Armstrong. She was the sister of Ivy Brinkley who also lived in Wetherden Road. In later years Elsie was cared for by Pat Burch and neighbours Glenda and Geoff Armstrong. 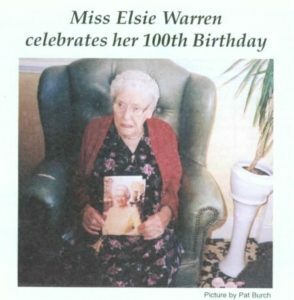 She moved to the Westcliff in Felixstowe in 2002 at the age of 96 years when she was no longer able to live on her own. She is very happy and well cared for there. Elsie is celebrating her birthday with her family and friends. The subject of the genealogy was born in Ipswich, and most of the ancestry concerns places in Suffolk, though of Margaret Goymer’s direct line only a single generation lived in Elmswell, whereas from other sources we can see Goymers of the same stock stayed here and multiplied! Joseph Gormar and Elizabeth Wright, both born about 1769 but we don’t know where, married and had eight children: Elizabeth 1784, Joseph 1786, Charlotte 1787, Mary 1789, John 1791, Jonathan 1792, William 1793, and Samuel 1799. John married Mary Burroughs of Woolpit and they seem to have settled there, as their son Robert and grandson Alfred (from whom Margaret is descended) were born in Woolpit. Jonathan married an Elmswell girl, MaryAnn Gladwell; he died here in 1851. Birth of Elizabeth Goymer about 1784. Birth of Joseph Goymer about 1786. Birth of Charlotte Goymer on 28 November 1787, baptism 30 November 1787. Baptism of Mary Goymer on 9 August 1789. Birth of John Goymer on 6 February 1791, baptism 9 February 1791. Birth of Jonathan Goymer on 4 July 1792, baptism 14 July 1792. Birth of William Goymer on 4 November 1793, baptism 13 November 1793. Birth of Mary Ann Gladwell in 1796. Birth of Samuel Goymer on 3 April 1799, baptism 7 April 1799.